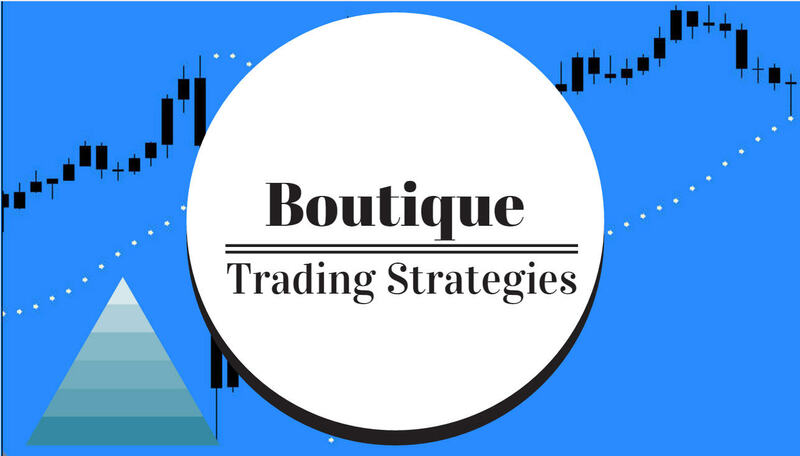 boutique trading strategies: One of the Simplest Trading Strategies! Is a Moving Average system going to be a good trading strategy? As we always have the option of using several different strategies it is to our advantage to have experience with more than a couple in order to cope with different circumstances and time frames and markets. One strategy may not work based on volatility, while another may not work because we have not the time to sit in front of the screen to monitor a chart, or, we may have only a few minutes to trade and we want to do as well as we can. Many times I have wished to have an automated strategy so that I did not have to spend time at the screen, especially when the best time to trade is at 3 or 4 am each day. Alas I do not always have an automated strategy and I have to get by with a manual method. Today I want to share with you a simplified strategy that uses a stochastic and a moving average on a one minute chart. 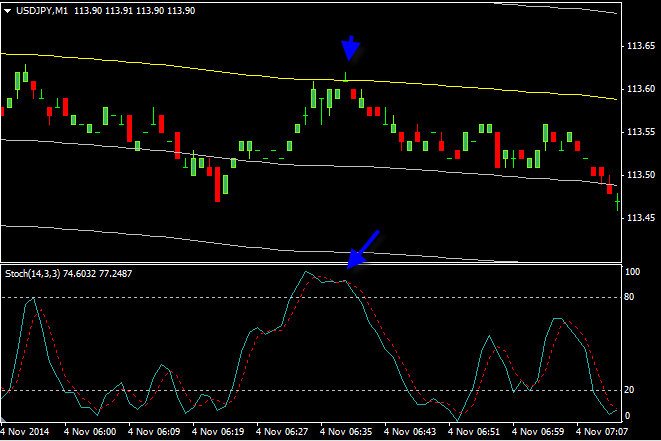 We will use a 200 ema and a 14,3,3 stochastic and plain OHLC bars to keep this as a simple strategy. There is something else that we need, we are going to place some deviation lines around the moving average as they can be used for support and resistance. You will see on your chart how these extra lines will suit the strategy quite well. Looking at a chart, it is interesting how these lines seem to fit so well with this strategy, you will see that as soon as you set up and start to scroll the chart. A most important aspect of this strategy is that we get the stop loss set so that we are protected as soon as the order is placed. As you are well aware, the market can offer volatility and the risks can be huge if we are not protected. We could be distracted from the screen by a noise outside or a child or a pet and instantly endure a loss. I would like to suggest the stop loss be no greater than ten pips, in fact, that may be too much. The important thing is that there be a stop loss. Now that we have the stop loss in place and the indicators on the chart, let’s have a look at what we can see by scrolling. The first thing to notice is that the 200 ema and the deviations act as both support and resistance for price. The lines give you an idea as to what you can expect as price approaches these lines. 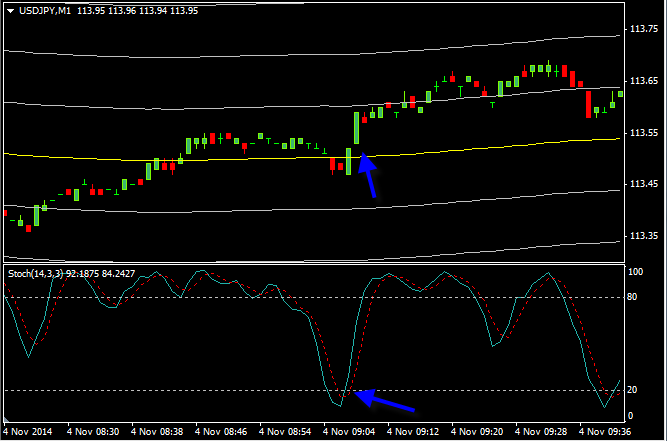 Next we can notice that the stochastic seems to react as these lines are approached and the hooks in the stochastic are potential entry or exit points. In many systems you would be buying when price is above the 200 ema and and shorting when below…. trend trading… In this trading strategy you can use the deviation lines to decide as to whether long or short entries are valid. On inspection, you will find that the lines are about ten or twelve pips apart…. 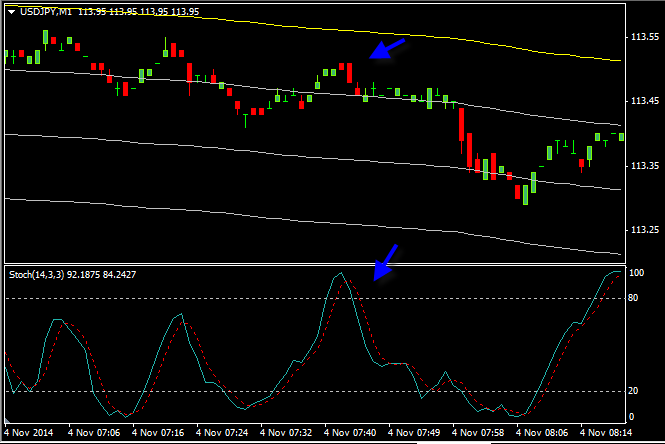 Using the stochastics and the lines allows you to make profits quickly. You will recall that I advised a maximum stop loss of ten pips, the distance between a pair of lines. The meat and potatoes of this trading strategy. I will make a few pics to illustrate how we can use this configuration. This first pic indicates a short in a down trend, the stochastic is well above the 80 line and as you can see the entry will be good for at least ten pips. On this next one we have an uptrend so we will enter a position long. 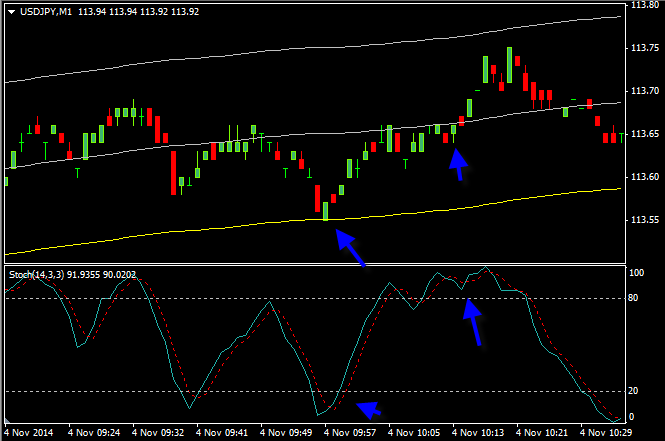 And we will be watching the stochastic to see if there is going to be bearish divergence. In this last pic we have an uptrend to enter on and then after a few bars the stochastic is telling us that there is another entry that will give us a quick 15 or 20 pips. In summary, there are several entries that you can use with this method, and if you are able to spend the screen time to practice this could become one of your favorite trading strategies. It will take time to master, it is not going to be a 5 minute exercise, you can plan to spend a few hours with live charts before you catch on and can make the entries so as to have profitable trades. What do you think of this trading strategy. Perhaps you will take a minute to discuss it.